Click to read Part I and Part II of the Rose Bowl series. 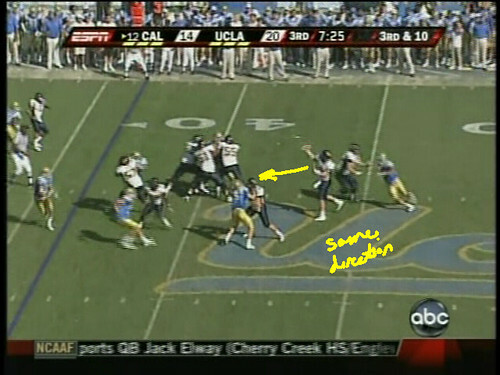 As the game progressed, DeWayne Walker seemed to take into account the adjustments Cal was making to his UCLA defense. Here you can see him revert from the Cover 4 and go back to the Cover 2. 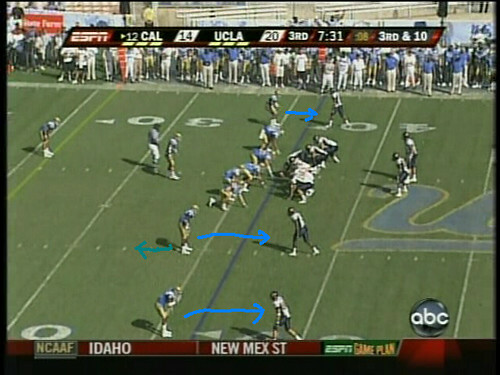 In a Cover 2 set, the corners do not cede space and make it much harder for offenses to find. Again, the key is to attack down the middle, as evidenced on the Stevens TD, or go to the areas the safeties are ceding you space. But you could see that receivers were missing routes or Longshore’s arm strength were decreasing. In either case, that option was not as strong as it was in the beginning. Notice here that the spacing between corners is much smaller than it was in the original. So while the deep ball is there, the defensive backs now have a chance to spy the quarterback and make a play on the ball. 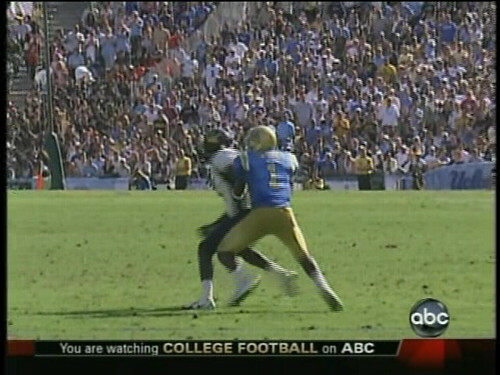 This makes the quarterback’s job to thread the needle all the more important. Now Nate does have one particular issue that defenses can keep an eye on. He locks in on his receivers. You can see on the two pictures above, his field of vision does not change; it looks like he’s watching Hawkins the whole way. 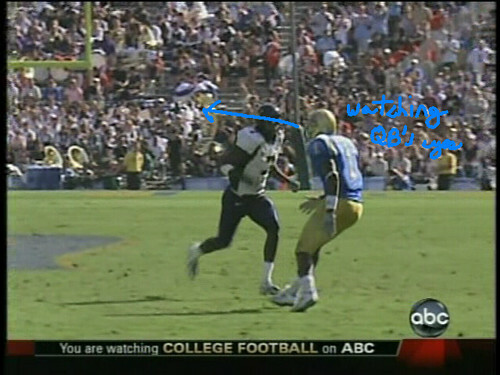 And this is a problem when UCLA corner Alterraun Verner is staring right back at Nate rather than following the receiver route. Instead of following Hawkins, he’s watching the direction in which Longshore is throwing, allowing him to get the inside track to the ball and disrupt the pattern Hawkins is running in, a standard scheme to attacking the Cover 4. But this is no Cover 4. 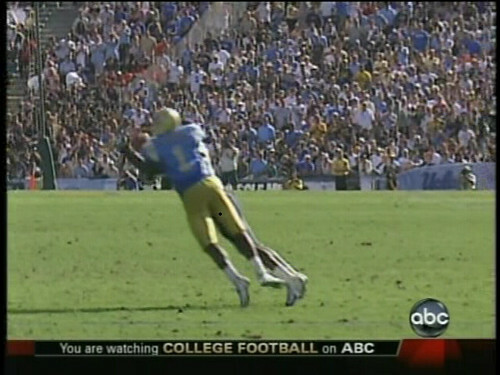 Huge interception by Verner, all made possible by playing close up on the receivers. Now this switch to the Cover 2 on a 3rd and long might be one of two things–Cal’s ability to exploit the standard Cover 4 package to pick up first downs, or to mix and match on Longshore to make it difficult for him to always throw short. Walker probably did this not only to test Nate’s arm strength, but to make his corners exploit Nate’s biggest issue at the end of games. He’s been dinking and dunking all day. He hasn’t thrown deep yet. Why play him deep? 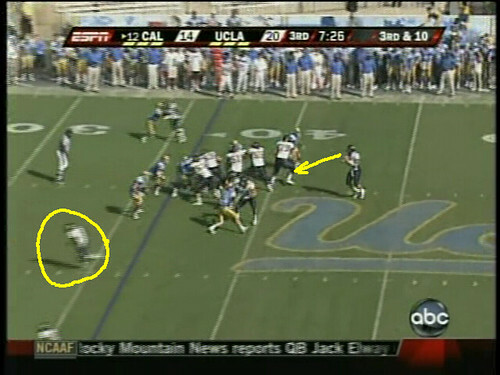 It could also explain why Tedford ran the ball late in the game–he knew that UCLA was not going to be as easy to pass on anymore. In any case, all of these issues led to the fatal denouement at the end, which I’ll diagram later this week.